Rose Ellen Sutcliffe, later Draper. My Uncle Alf Sutcliffe, my aunt Edith 'Edy' Sutcliffe, my father Alan Sutcliffe, my grandad Frank Sutcliffe, my uncle Lawrence 'Lol' Sutcliffe in Pleasley Vale, circa 1935. My father Alan Sutcliffe fishing in the river Meden after school with my aunt Doris 'Dol' Sutcliffe and my grandfather Frank Sutcliffe, Pleasley Vale. My aunt seems to be over dressed for a fishing trip! 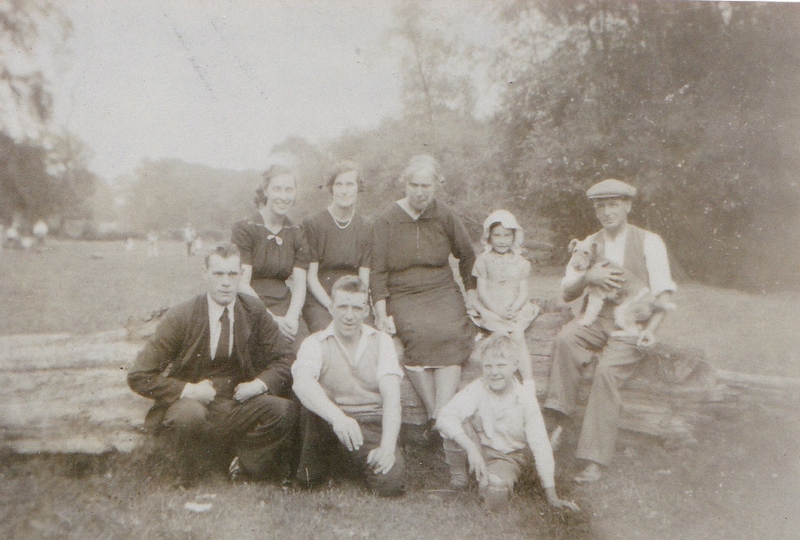 The Sutcliffe family in Pleasley Vale, Raymond, Ede, Lol, Dol, their mother Rose Ellen, grand daughter Marlene, their father Frank, Alf, Alan, and their dog 'Lady' late 1930's. My Sutcliffe family moved to Woodhouse from Alfreton. 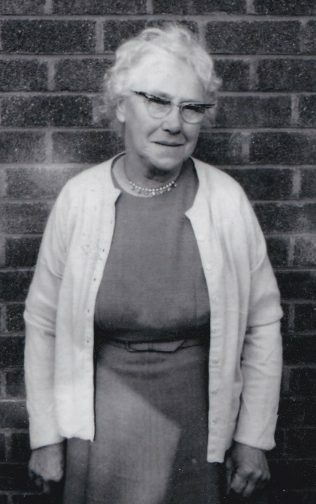 My paternal grand mother Rose Ellen Cumberland, was born in Bradmore, Nottinghamshire, in 1889. For reasons unknown to me, after school she worked in Alfreton and whilst there met my grandfather Frank Sutcliffe. Frank was born in Alfreton in 1874. The Sutcliffes, originally a Halifax family, had been living in Alfreton since the 18th century. Their menfolk were variously employed in practical occupations, bricklaying, stone masonry and mining. It was mining that brought Frank and Rose to live in Woodhouse. They lived in Shelley Avenue and raised a large family. My father, Alan, was their last child, he was born in 1930. 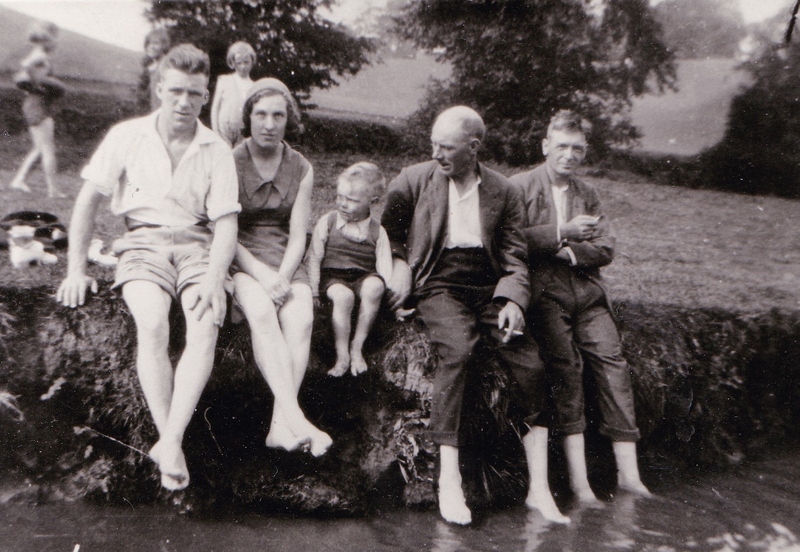 Their other children were Alfred, Doris, Raymond, Lawrence, Edith and Frank. My grandfather Frank died in 1940. Some time after his death my grandmother Rose married again to John Draper, but he was killed in an accident not long afterwards. Later in life Rose moved to one of the small bungalows in Hazel Grove. She died in 1985. All of Frank and Rose’s children have now passed away but there are, I believe, still some Sutcliffe offspring living in Woodhouse. As a child ‘Gran Sut’ as I knew her, would take me for walks to Pleasley Vale, which she called ‘Littlewood’. 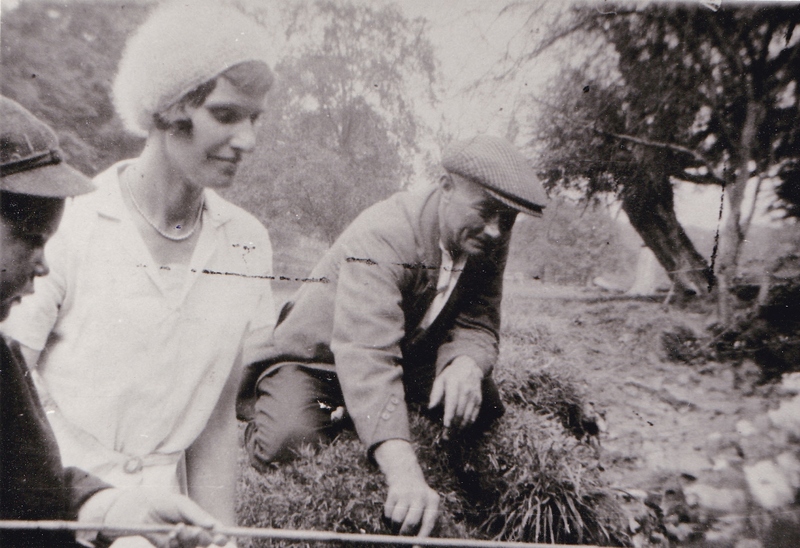 She was a keen gardener, so our walks had a dual purpose, recreation and also collecting horse dung for her garden. We would take a wheelbarrow and shovel with us and scoop up the dung which in those days was plentiful about the lanes (1960’s). I remember the strong fragrant scent of Littlewood’s wild garlic and the bluebells and paddling together in the river Meden. I have Gran to thank for nurturing in me a love of the countryside that has never left me and despite my now living in Hampshire, I return to walk the vale every year. Here are a few early photographs of the Sutcliffe family. Pam, Pete, Kate, Jan and Rich, all Ray and Kath’s children. Just Richard’s two lads carrying the name forward. Frank’s daughter still lives I think in Crich, Derbyshire.